Original Peter Pan artwork and unseen letters from famous authors such as JRR Tolkien and Agatha Christie are on display in East Dunbartonshire. The event at Harper Collins office in Bishopbriggs is part of the Doors Open Days season, which is promoted by the Scottish Civic Trust. The open day includes maps showing the changing face of Glasgow through the decades. There are explanations of how dictionaries are made. 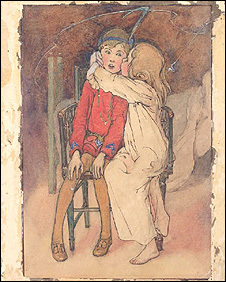 The open day features original artwork by Alice B Woodward from the 1907 edition of Peter Pan. Felicity Windmill, records and information manager at Harper Collins, said visitors would also find the letters fascinating. "The letters perfectly illustrate the kind of correspondence these authors engaged in with their publishers," she said. "They uncover fabulous little insights such as Agatha Christie's dislike of the covers chosen for her books. "The letters from JRR Tolkien are wonderful, as they are beautifully written and illustrated, and also show just how much influence Rayner Unwin, the 10-year-old son of the publisher Sir Stanley Unwin, had in the creation of The Hobbit." More than 950 buildings are expected open their doors throughout September as part of the initiative, with about 300 taking part nationally this weekend. Trust director, Terry Levinthal, said: "Doors Open Days holds a special place in the hearts of many Scots and visitors because it provides unparalleled access to sites of historic, architectural and cultural interest. "The sheer range of open buildings is incredible." A full list of buildings taking part can be found on the Doors Open Days website.